For most of us, there’s a point in the hobby that we approach with anticipation and – it must be said – some anxiety. It comes after the track is laid and the layout is wired, and it’s time to turn on the power and run the first train. Is the track work good enough, or will the train derail? Will it even run at all? Maybe there’s a short, or a bad solder joint, or something else? The anxiety is even more acute when the first attempt at running a train takes place in a public venue – like a train show. And, for a real case of the jitters, there’s nothing like testing modules, for the first time, in public… while the whole thing is being recorded for an Internet TV show. Naturally, that’s exactly what I did with the two modules I built as my contribution to the S Scale Workshop Free-mo style exhibition layout. As regular readers know, I took these two modules to the inaugural North Shore Train Show in the Montréal, Canada area last October – and yes, they did work as advertised. Click on the image above – or follow this link – to start watching. You need to be a subscriber to TrainMasters TV to see it, but membership is quite reasonable. 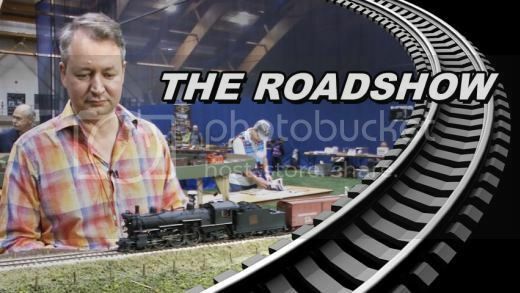 As always, a tip of the hat to TrainMasters TV brass hat Barry Silverthorn for making me look like I know what I’m doing. Enjoy if you watch: I did! This entry was posted in S Scale Workshop, S Scale Workshop-Modules, TrainMastersTV by Trevor. Bookmark the permalink. Thank you for the opportunity to help out.